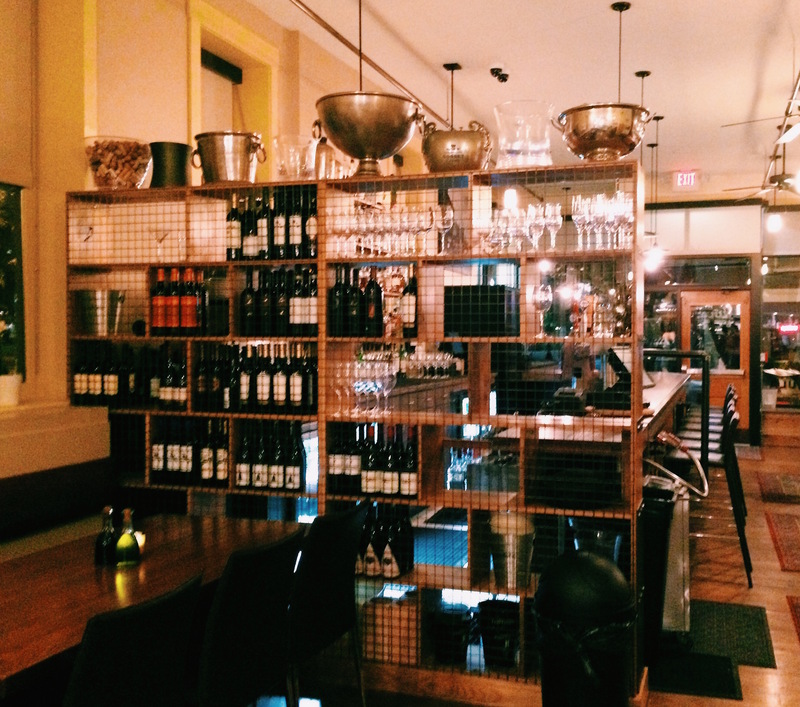 Zula Restuarant & Wine Bar – Go There. Try That. 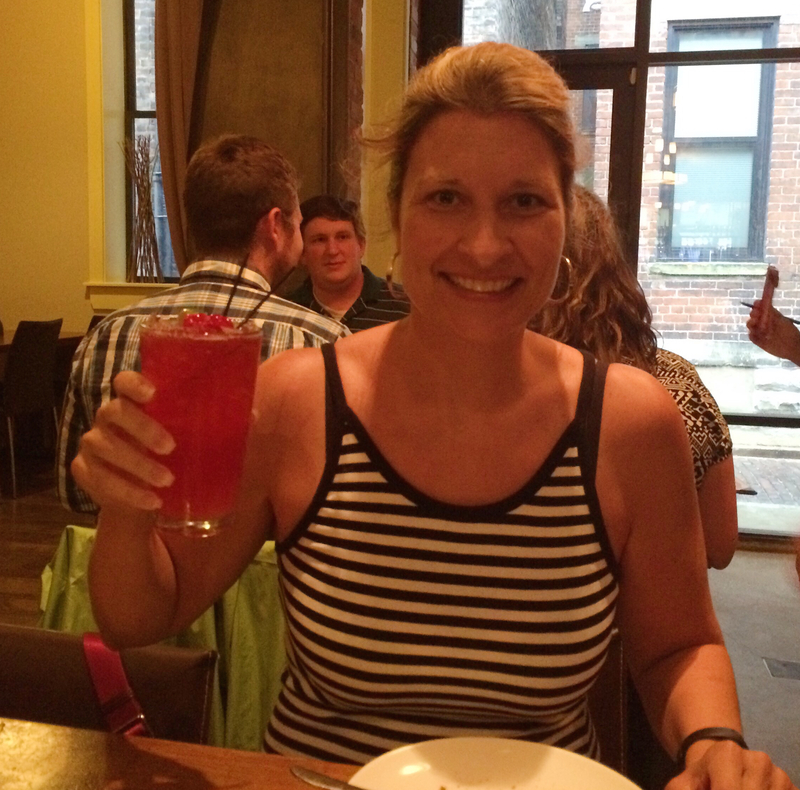 A night out with my dear friend Beth, a seafood lover, led me to Zula Restaurant & Wine Bar. 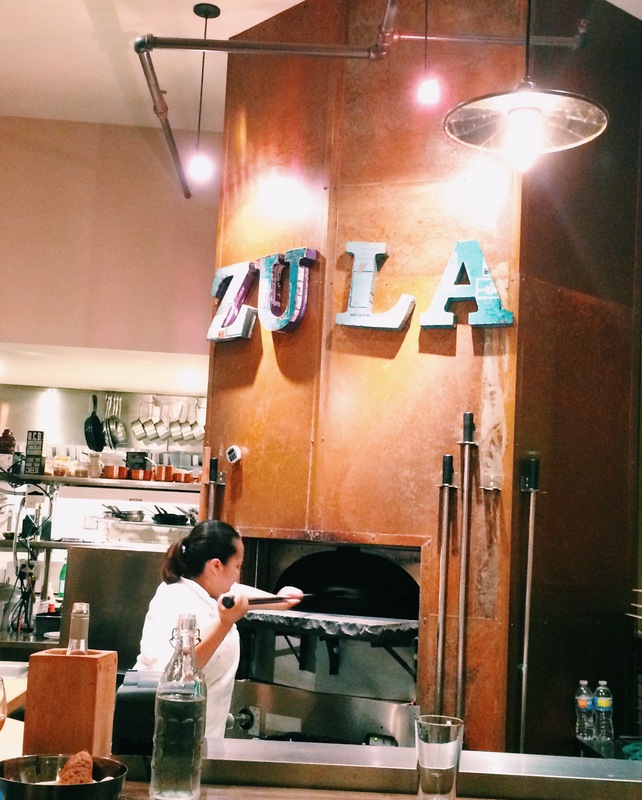 I, of course, wanted to try someplace I’d never been and Zula has a reputation for both good seafood and artisan flatbreads. Now, I was a little apprehensive because some places in OTR (Over the Rhine) are very small and crowded; thus, they don’t lend themselves well to conversation. 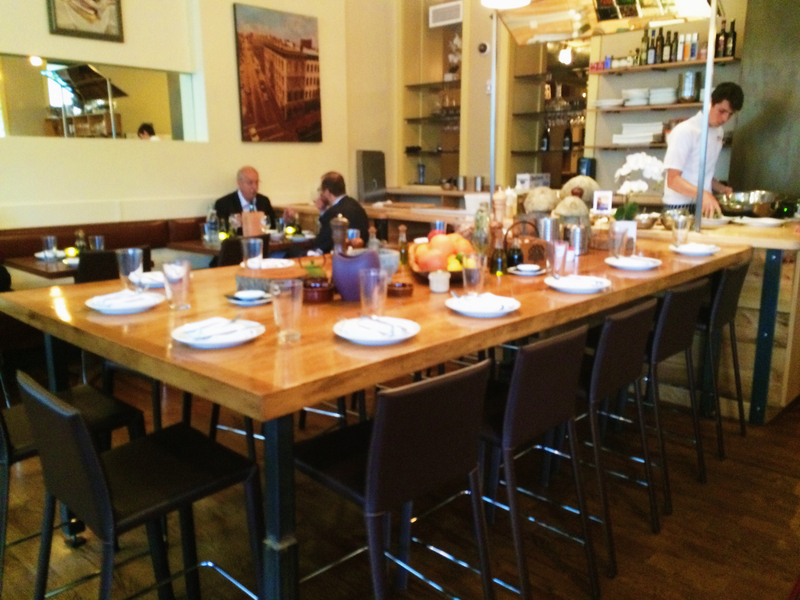 I was grateful to find Zula a bit larger with more than one room, various size tables, and a quite charming environment. 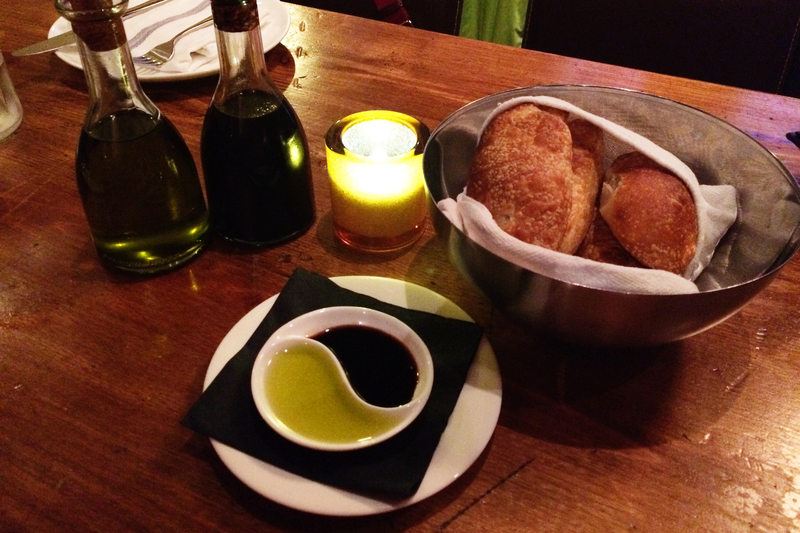 Our meal began with the artisan bread basket. Addictive. The rolls have a crispy outer-shell, yet are dense on the inside with air pockets- kind of reminded me of sourdough, but I know it’s not. I loved the texture! The chef of Zula is from Tel Aviv, Israel and his bread, served warm, takes 4 to 5 days to make, and is a family recipe. Add a little olive oil and vinegar and it’s the perfect start to the evening. After walking us through the menu, our waiter, Matt, brought us two fruity cranberry-lemon mocktails! Tip: Zula is a small plates restaurant, although the plates really didn’t seem that small, so the food is meant to be ordered and shared. Perfect! Beth and I both love sushi so we decided to start with the Rare Seared Tuna. Oh. My. Goodness. This tuna, this melt in your mouth, perfectly seared on the outside, seasoned in cracked pepper tuna, was served over eggplant puree, shaved radish, and micro greens (very Top Chef, right?). It’s simple and extravagant at the same time. Did I say melt in your mouth good?! We both agreed that we could go back and order several more! Definitely a stand out dish. I would also like to try the Yellow Fin Tuna Crudo which sounds equally divine. As much as I love a good sushi roll, this stands far above the regular half price sushi night crowd. This is by far the best tuna I’ve had. 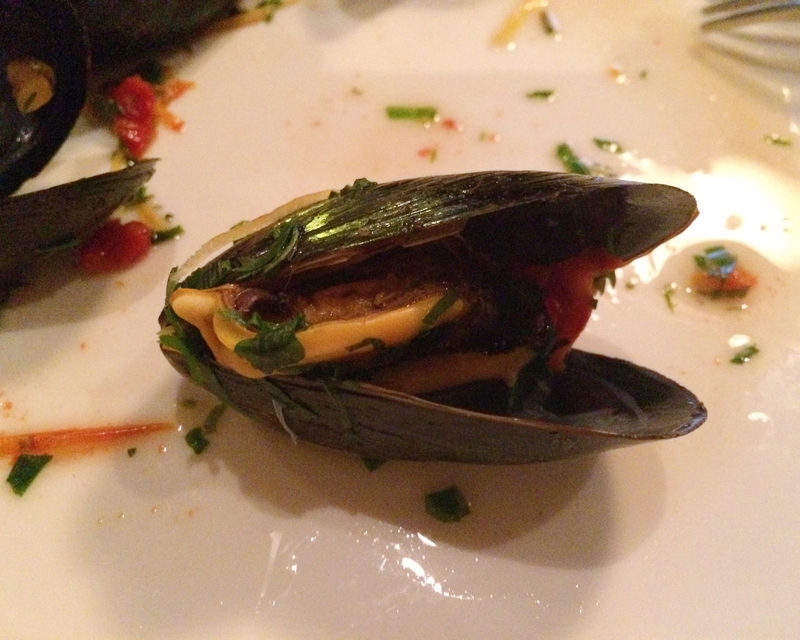 So, moving to the next course, what I did not know about Zula is that their speciality is mussels. I’ve only had mussels once, years and years ago, and I wasn’t impressed. Beth, who really loves seafood remember, was also not particularly excited about mussels. I quickly feared I’d made a mistake in my restaurant choice for this girls night out. Luckily we were both super pleasantly surprised. 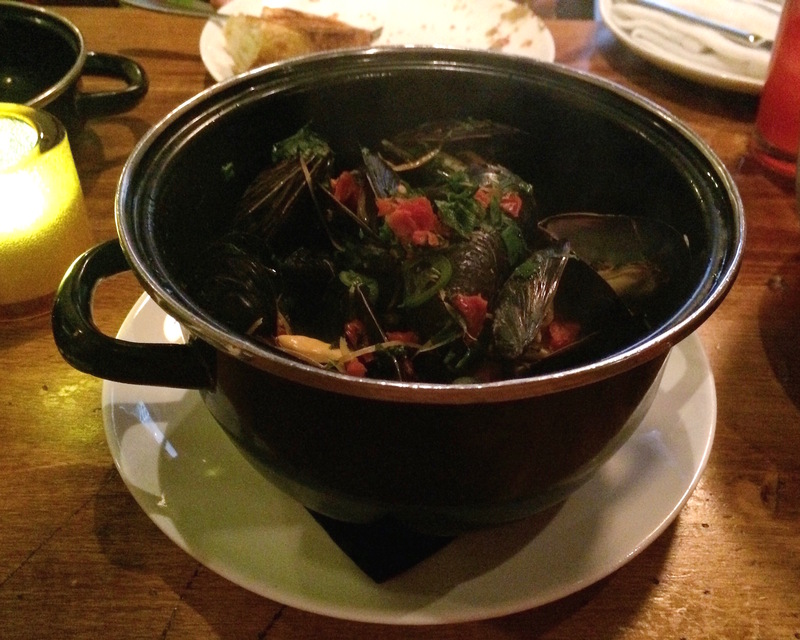 At Zula the mussels are steamed in a flavored broth. You pick from a plethora of choices ranging from Thai, to Manhattan, to Vietnamese Pho, to New Orleans, to French Classic. It’s like a culinary world tour in mussels. While the waiter said the Thai (coconut milk, fish sauce, lemon grass, ginger, tum-yum broth, thai basil) was the most popular order from the mussel bar, not being coconut milk fans, we went with the Mediterranean (scallions, serrano peppers, garlic confit, lemon, parsley, mint, and sun dried tomatoes). These mussels were perfectly steamed, tender, not fishy at all, and so deliciously aromatic! I loved the garlic, lemon and mint together and the peppers added just enough heat. I think it’s safe to say that while we may have been hesitant at first, the adventure reminded me to always try, try again! We both said we could eat those mussels all day! To finish our journey around the menu, we had to try one of the flatbreads and quickly agreed on the Thyme Roasted Tomatoes. This had fresh mozzarella, basil essence, and a balsamic reduction. 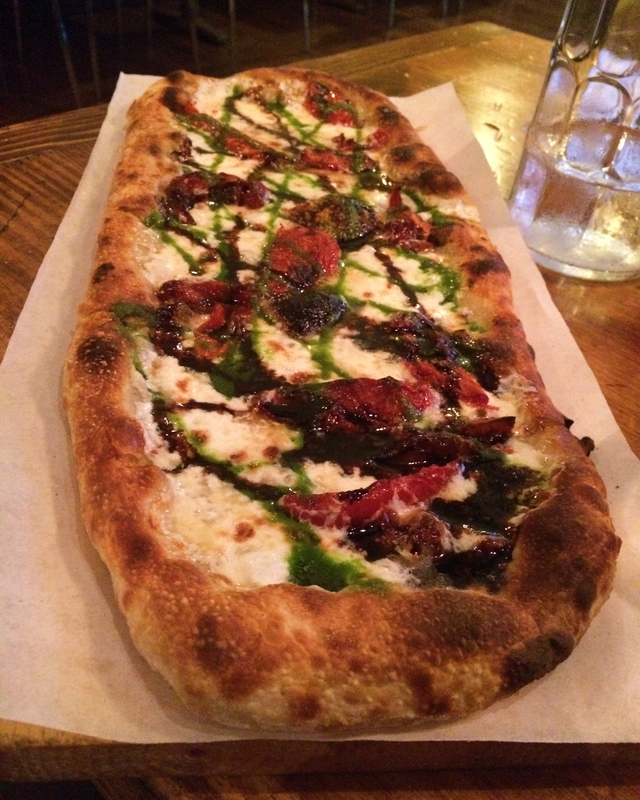 The flatbread, hot out of the oven, is crisp on the outside and just thick enough to handle the toppings. I loved that I could taste and appreciate each carefully chosen ingredient. Again, I wasn’t sure what to expect with the combination of mozzarella and balsamic but it was fabulous! Honestly, I loved this dish, but it was just out shined by the tuna and the mussels. Yep- the tuna and mussels were that good. Thankfully, as always, we had lots to talk about because I didn’t want to leave without trying dessert; so, we had some time for our meal to settle. As I’ve gotten older, bolder…and addicted to cooking shows, I’ve learned to trust a waiter’s recommendations, even if that recommendation isn’t always something I think my palate would enjoy. As anyone who knows me could tell you, I’m a chocolate dessert girl and not a baked fruit girl; however, when our waiter suggested I try the Raspberry Marsala Cake, I went for it. Ok, hesitantly went for it. Again, thank you Matt! This is a warm sponge cake filled with raspberries boiled down in a red wine and sugar reduction served with marscapone cream, lemon sauce, and blueberries. This is the type of dish which requires all components on the fork for that one perfect bite. The sweetness of the sponge and cream balances really nicely with the tartness of the lemon sauce. Full disclosure, I also tried the Salted Caramel Creme Brûlée and while the cookie spoon was original and there was a nice torched caramelization on top, the salted caramel wasn’t my favorite. 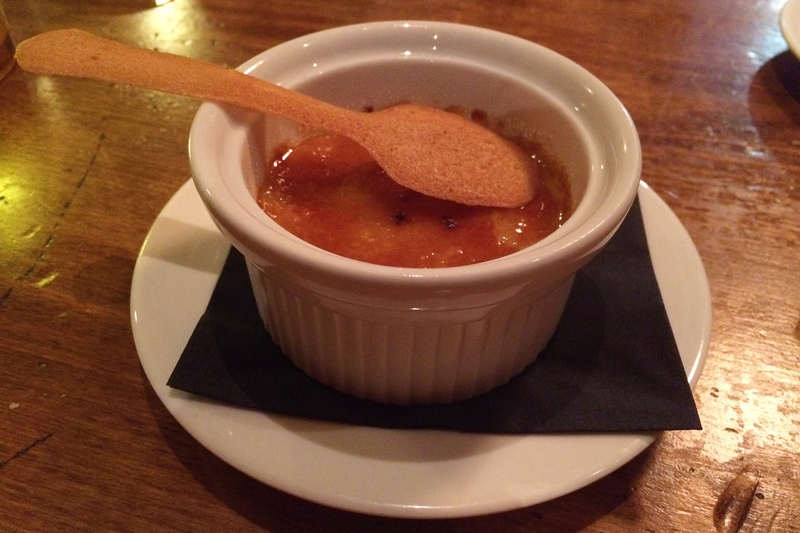 I am a big creme brûlée fan, but I think I just prefer the traditional and not salted caramel. The Raspberry Marsala Cake is a winner though! Fun fact: The art on the walls, painted by local artists, is for sale! As a supporter of all things local, I think this is such a cool way to decorate a restaurant! 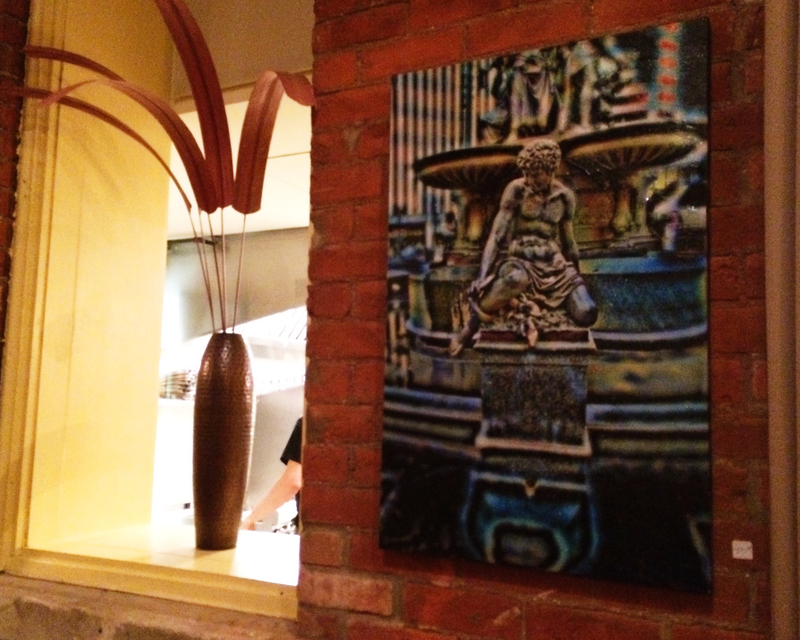 The local artwork on the exposed brick creates a really nice environment. 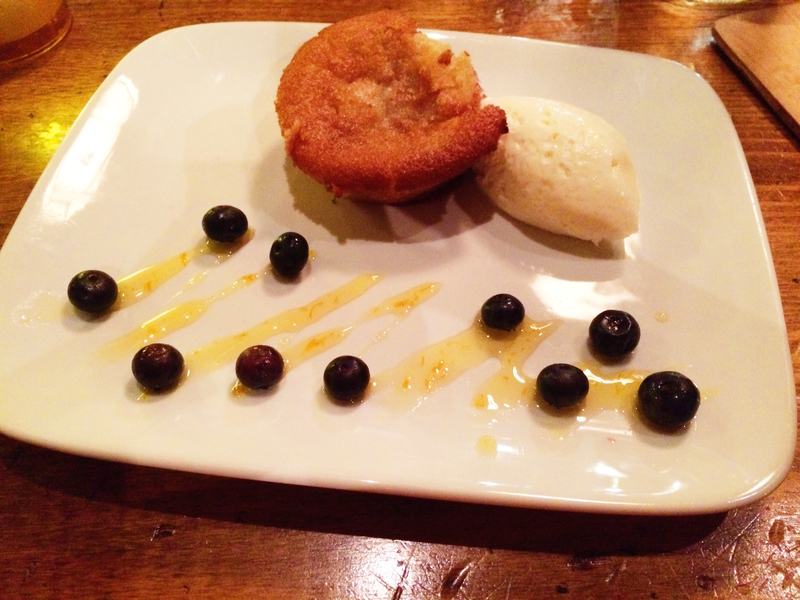 The food at Zula Restaurant and Wine Bar is fresh and flavorful and I truly cannot wait to go back! 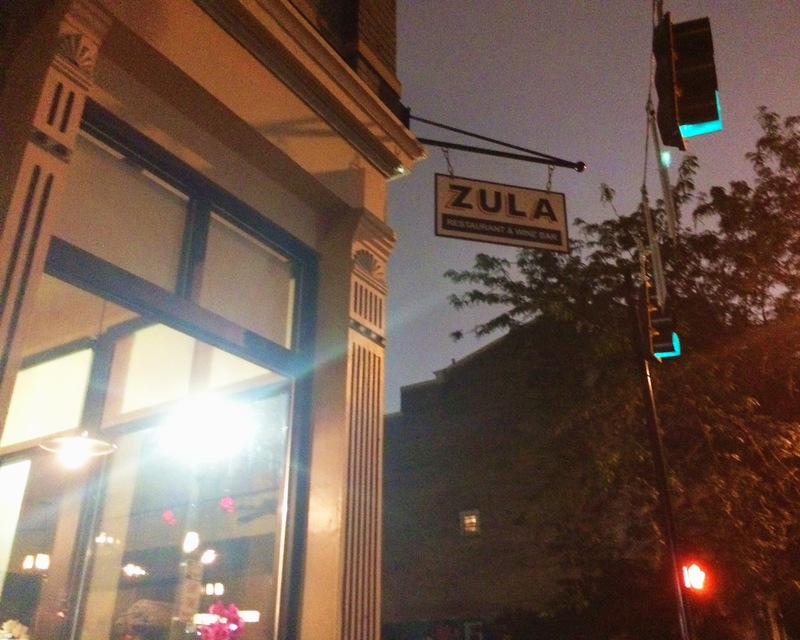 Zula is located across the corner from Washington Park so if you’re lucky, you can park in the garage underneath the park and take a stroll before or after dinner. GO THERE (Zula)! 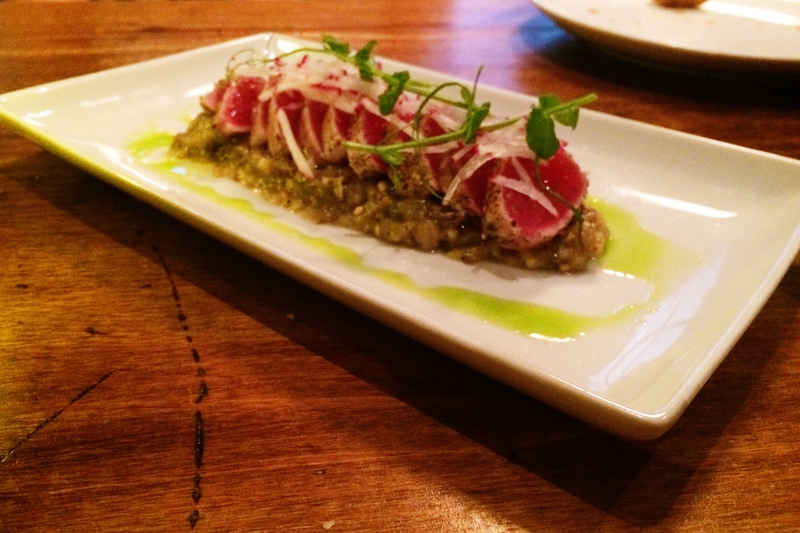 TRY THAT(Rare seared tuna, mussel bar)!